It’s about time I stopped drip-feeding these Vanuatu photos and presented the “best of the rest”. Ted MacRae encountered a similar looking fly in his travels through Brazil (and took a much better photo, you shold check it out) and he had the skill and the perserverance to work out his fly was from the family Neriidae (sometimes called cactus flies or stalk legged flies). Evidently, the feature that seperates Neriids from realted families is the bristle like “arista” on the top of the antennae which is nice and clear in this photo. Neriid species from the genus Telostylinus have been recorded from New Caledonia (which is adjacent to Efate, the island on which were staying in Vanutatu) and the black and white stripes on this fly suggest its from this genus. If you look at Ted’s photos, you can see the forelimbs of male Neriids are spiked, a feature you usually see in predators like crab spiders and robber flies which need to grab and hold their prey. Neriids eat rotting plant material, which is unlikely to escape their grip. It seems the spikes are used when males wrestle and strike each other in the hope of gaining access to females. 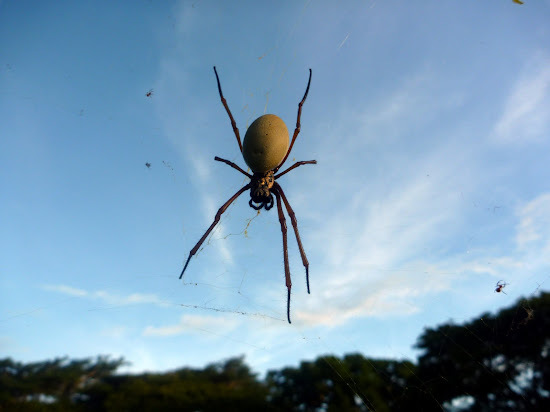 You’d have to try very hard to miss these massive orb web spiders, in the fifteen minute drive from the airport to house at which we stayed I spotted five or six. In town, they tend to set up their webs on power lines and between houses. I gather they are Nephila plumipes, one of the golden silk orb weavers. Unfortunately, becuase they weave their webs at such great heights and I couldn’t get close enough to them, these photos don’t really show how massive these spiders are. Female Nephilla are the largest of the web building spiders, their bodies alone are about 50 mm long and their webs span 2 metres. If you look closley at the photos above you’ll see some much smaller spiders in the same web as the massive one. The smaller spiders could very well be ‘kleoptoparasites’, species that live within the webs of larger spiders and steal their host’s prey. But, it’s also quite possible some of the smaller spiders are males of N. plumipes, eyeing up the much larger female as a potential mate. Thanks to Alex Wild for finding that video, his post presenting includes a great photo of the difference between a male and a female Nephilla. Love your blog. Kids and I are trying to identify a beautiful spider in Port Vila. The female has a yellow back and red/black banded legs. Very docile and friendly. Any idea what her name is please. If you have facebook I have posted a picture at svrockhopper.